October | 2013 | Receiving. HPI: 2-year-old boy with a history of eczema presents after a possible clonidine ingestion. The mother states that she put the child ton bed and upon checking on him later in the night, found him with an open pill bottle of 0.1 mg clonidine tablets. She apparently had left her purse reachable to the child. She is not sure if and how many pills the child ingested. Incident occurred at 11:00PM. The mother noticed the patient became lethargic and limp; therefore, she brought him to the SG ED. 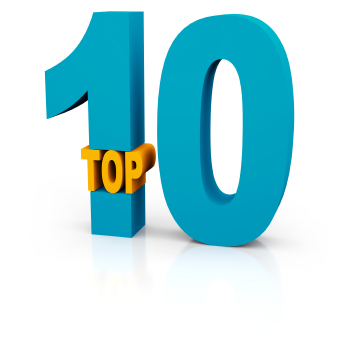 Do you have a list of medications in the home? Blood pressure: 116/62, Pulse 123, Temperature 36.7, respiratory rate 20. Eye: Pupils are small, 2 mm, equal and reactive. Cardiovascular: Tachycardic, S1 auscultated, S2 auscultated, No rub, No murmur, No gallop, Good pulses equal in all extremities, Normal peripheral perfusion, No edema. Gastrointestinal: Soft, Non-tender, Non-distended, Normal bowel sounds, No organomegaly. Musculoskeletal: Normal range of motion, No swelling, No deformity. Neurologic: Normal deep tendon reflexes, Not alert, No clonus or other abnormal movements, Moving all four extremeties, Non focal exam. Electrolytes normal; What was the AG? Presented by Dr. Andrew King. 25 YOM presents to the ED complaining of sudden onset of right foot pain while playing football earlier today. He states that he was bearing all of his weight on his right foot at the time of the onset of pain. He states that his pain is significantly worsened with bearing weight and ambulation. He denies numbness and tingling. He denies any previous right lower extremity injuries. A right foot x-ray was obtained. 1. What abnormality should be identified in these radiographs? 2. What is the most common secondary/associated fracture involving the above abnormality? 3. Which statement is true of the proper treatment of the above injury? 1. Correct Answer C. Lisfranc Fracture. Separation of the bases of the 1st and 2nd metatarsals should be evident in this film. It also appears as though there may be an avulsion fracture of the base of the 2nd metatarsal associated with the dislocation injury. No evidence of Jones or Pseudo-Jones fracture is noted in these views. 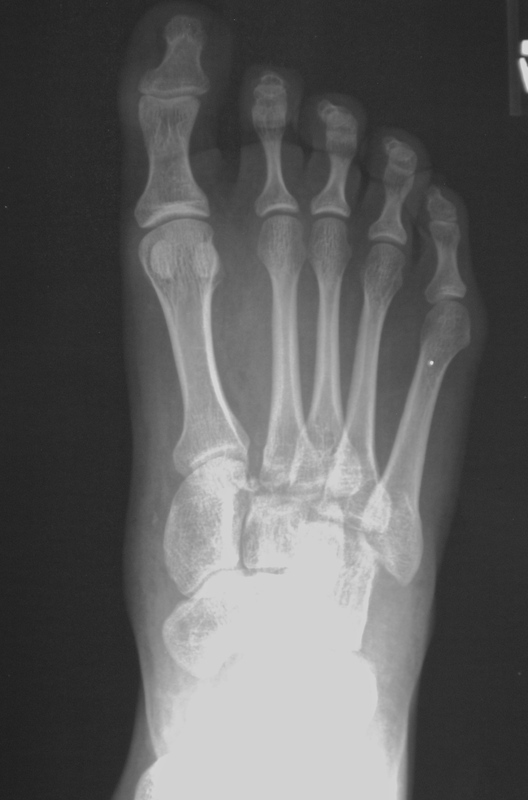 No accessory bone is noted near the base of the 5th metatarsal to suggest Os peroneum. 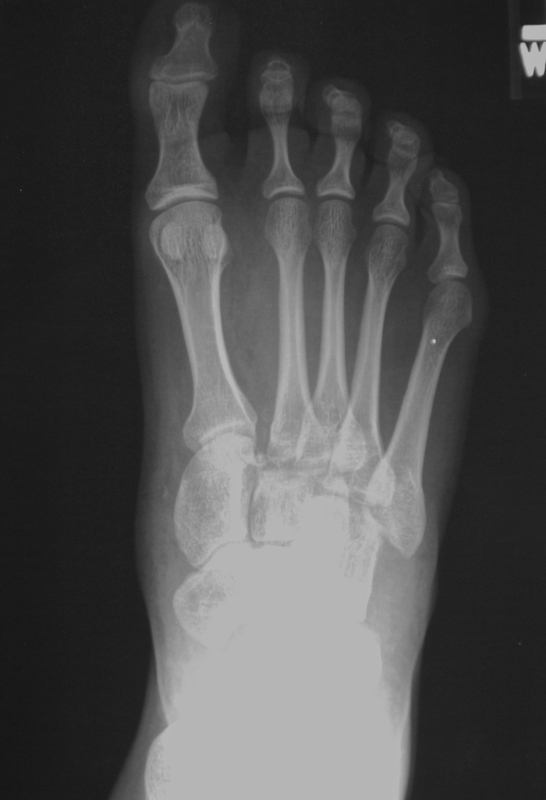 Os peroneum is very common seen in nearly 26% of foot x-rays and should not be mistaken for apophysis or avulsion fracture of the 5th metatarsal. 2. Correct Answer A. Base of 2nd Metatarsal Fracture is the most common fracture associated with a Lisfranc injury/dislocation. Calcaneal fractures are not directly associated with Lisfranc dislocation fractures however should be suspected in MVC trauma patients that sustain Lisfranc injury. Cuboid fractures are seen as a result of Lisfranc dislocation however not as commonly as 2nd metatarsal fractures. 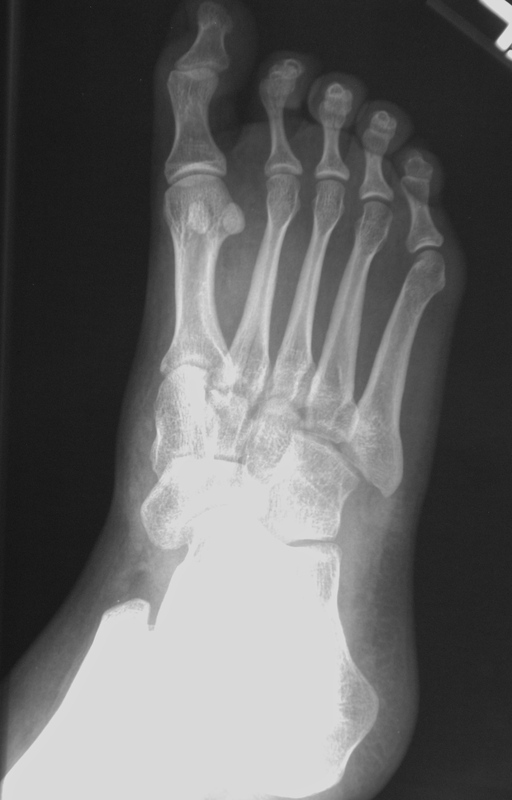 Avulsion fractures of the 5th metatarsal are not commonly associated with Lisfranc dislocation. 3. Correct Answer B. ED Orthopedic consultation and evaluation. Lisfranc dislocation injuries all need to be evaluated immediately by an orthopedic surgeon. If unstable, surgery is the only corrective measure. The patient is to be NWB on the affected lower extremity. They should be placed in a short leg splint to stabilize/immobilize the foot and ankle. 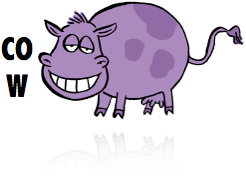 Conventional radiographs are usually sufficient to demonstrate the injury. 54 YOM presents to emergency department complaining of midsternal chest pain that he states has been coming and going for the past few years. He states it has worsened over the past week becoming more constant. He denies exertional component to his chest pain. He denies any shortness of breath or difficulty breathing. He does state that he intermittently feels nauseated but does not have any episodes of emesis. He denies any fevers, chills, and productive cough. He states that he has a history of hypertension, diabetes, and coronary artery disease with CABG x3. The patient’s physical examination is unremarkable. 1. What significant abnormality is noted on the PA view of his patient’s chest film? 2. What is the most preferred initial screening/diagnostic test if the above condition is suspected? 3. What is the preferred initial pharmacotherapy? 1. 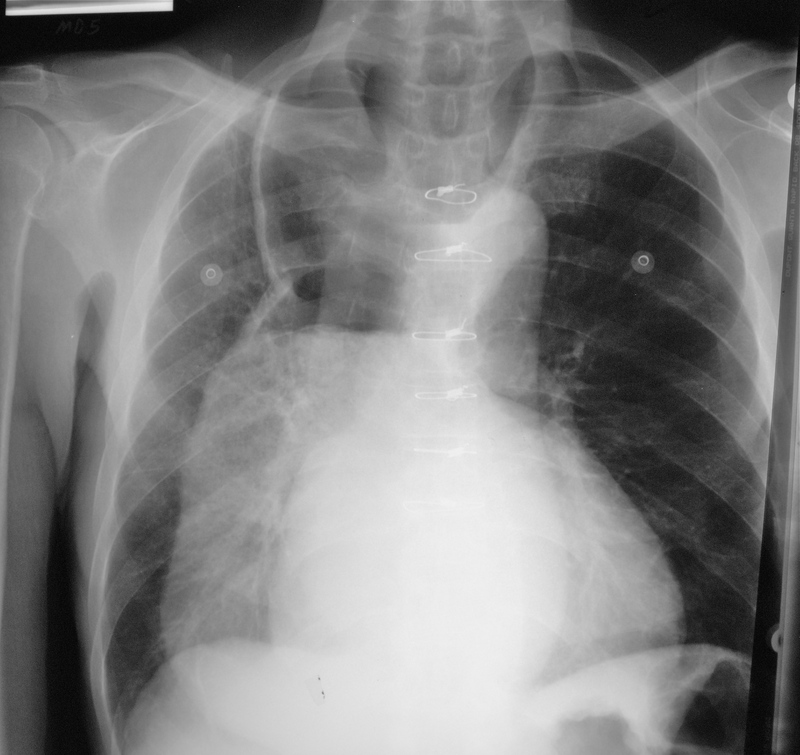 Correct Answer C. Esophageal dilatation with air-fluid level is the most notable abnormality on the PA view of his chest x-ray. This is often seen in an advanced achalasia as the lower esophageal sphincter as constricted and not allowed any liquid or solids to pass causing significant dilatation of the esophagus. 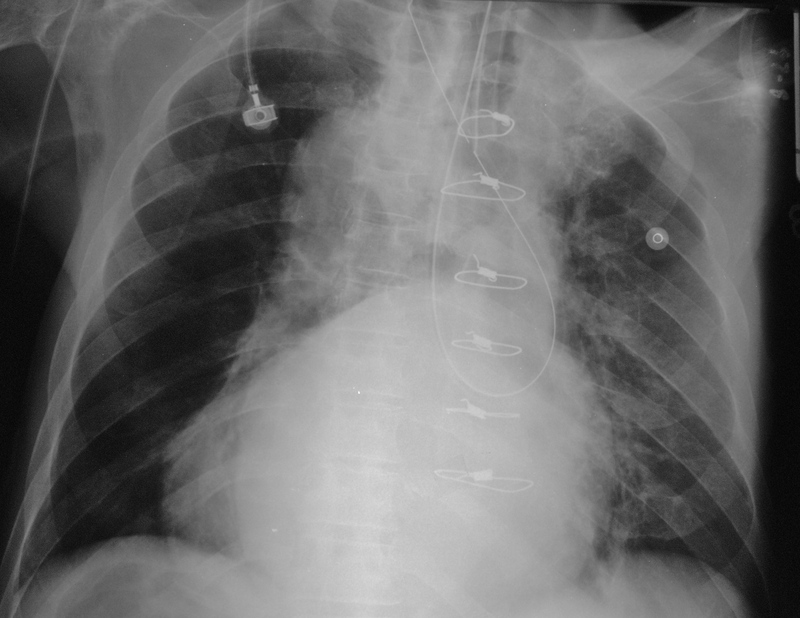 No acute infiltrate is noted in the chest x-ray to suggest pneumonia. No increased pulmonary vascular congestion is appreciated. Pulmonary embolism should be considered however no shortness of breath or history of DVT/PE exists. No Westermark Sign is noted on his chest x-ray. 2. Correct Answer A. Barium Swallow is the preferred initial screening test if achalasia is suspected. 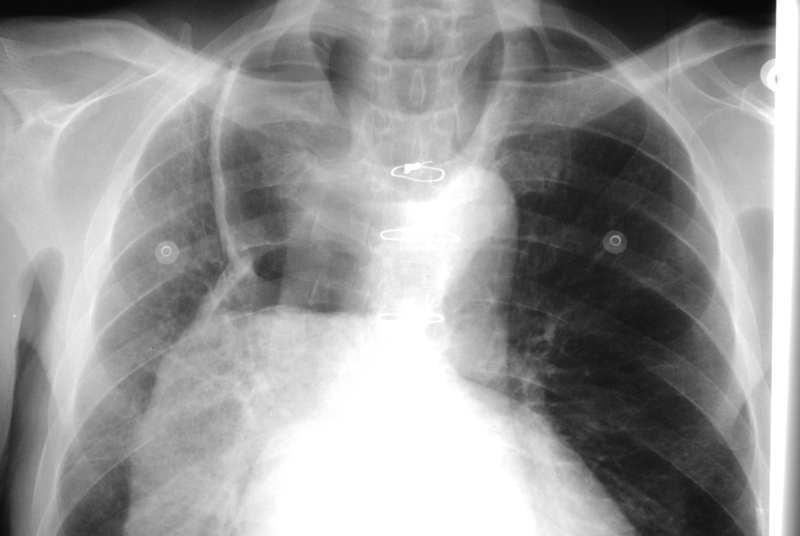 Extensive esophageal dilatation is typically only noted 1 chest x-ray in advanced cases. A CTA thorax is the preferred modality for diagnosis of acute pulmonary embolus. A d-dimer should only be used in the low risk patient’s suspected of having a pulmonary embolus with a Well’s score of less than 2. An echocardiogram is also a good screening test for both acute pulmonary embolism with right heart strain as well as for acute heart failure however it serves no role in the diagnosis of achalasia. 3. Correct Answer B. Calcium Channel Blockers or Nitrates are the preferred initial pharmacotherapy for smooth muscle relaxation in patients with achalasia. Ceftriaxone and doxycycline are preferred for patient’s being admitted with acute community acquired pneumonia. Heparin bolus with subsequent drip is preferred in patients with acute pulmonary embolus that may undergo PCI. Fondaparinux with Coumadin overlap is preferred for stable patient’s with acute pulmonary embolus. You are working your first overnight shift at your new job right out of residency. Part of your contract is to cover a smaller satellite facility with limited resources that takes a steep dive at night. The triage nurse rolls by your station with a young woman in a wheelchair. The nurse is moving with purpose, which makes you a little nervous. The patient is bent over and holding her abdomen. She holds an emesis basin on her lap. It looks like there is a small amount of blood present. She seems sleepy but arousable and is unable to give much of meaningful history. The nurse gets her in bed and points to her gravid uterus. She grimaces and puts the patient on the monitor. Her husband arrives. He says that she has been depressed and withdrawn recently, not sure why. She texted him an ambiguous farewell message a few hours ago. He hands you an empty bottle of prenatal vitamins. He says that she just bought this a couple of days ago and is concerned that she took all of them. Neuro: Sleepy. Follows commands. MAE x 4. Normal reflexes at knees and ankles. No rigidity. QUESTION #1: You are concerned about overdose. What component of the prenatal vitamin is most concerning? ANSWER: D. Because hypervitaminosis A can cause both toxicity in the mother and the fetus, prenatal vitamins are specifically formulated with reduced amounts of vitamin A. Iron toxicity is the most concerning component of prenatal vitamins in overdose. QUESTION #2: Which is not an indication for deferroxamine? ANSWER: A. Deferroxamine should be considered in patient looks ill, has repetitive vomiting, lethargy, hypotension, metabolic acidosis, and an iron level >500 ug/dL. 4-6 Hour levels are preferred, however, iron poisoning is a clinical diagnosis. Clinicians should not rely on a single measurement and a normal iron level does NOT rule out toxicity. QUESTION #3: What are potential adverse reactions of deferroxamine? ANSWER: F. Deferoxamine chelates free iron throughout the body and minimizing disruption of oxidative phosphorylation and improves metabolic acidosis. Interestingly, deferoxamine does not chelate a large amount of iron; however, the small amount of free iron it does chelate leads to significant clinical improvement. Chelation of iron creates ferrioxamine and is eliminated by the kidneys. Ferrioxamine SHOULD cause a reddish color of the urine (so-called vin-rose urine). Deferoxamine should be started, titrated up, and continued while the patient remains ill. Hypotension is rate-related. Cases of ALI and ARDS are usually described in those with prolonged therapy (>36-72 h of therapy). In the 1990s iron was the leading cause of poisoning deaths, at least reported to the Poison Center, among children < 6. The requirement of industry to use blister packs have been subsequently overturned. Because iron is a transition metal, it can accept and donate electrons relatively easily and this feature is utilized in many biochemical process, most notably in the electron transport chain, myoglobin and hemoglobin. The body cannot actively excrete iron, therefore, total body iron is regulated by absorption. In iron-deficient states, iron uptake by the duodenum can increase to 95%. In therapeutic dosing, certain functions are saturated and further uptake is limited, however, in overdose, oxidation and disruption of the GI mucosa allows iron to be absorbed by its concentration gradient. Toxicity depends on the amount of ELEMENTAL IRON anticipated to be absorbed. Calculating the amount of elemental iron in a given supplement depends on the molecular weight of the compound. See the table below for the percent elemental iron per formulation (Adapted from Goldfrank’s Chapter 40, table 40-1). Chewable vitamins tend to have lower concentration of elemental iron (10-18 mg) per tablet when compared to prenatal vitamins (65 mg) and, accordingly, fatalities have not been reported. 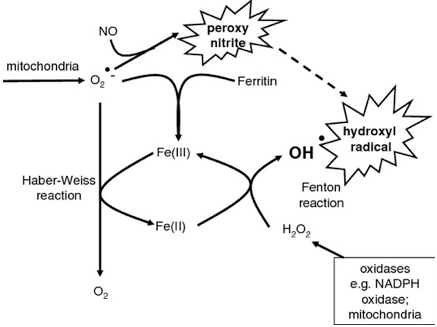 Iron generates oxidative stress via the Fenton reaction and the Haber-Weiss cycle. These reactive oxygen species oxidize membrane lipids and damage GI epithelium. Once saturated, “free” iron is free to distribute to the various organs. Stage 2: “latent stage”. GI symptoms have resolved but develop AMS, metabolic acidosis, and tachycardia. THEY WILL APPEAR ILL. Stage 3: “Shock stage” Coagulopathy, seizures, coma. Intravenous administration should be increased to 15mg/kg/h. Continue therapy until patient is clinically well. For pregnant patients: TREAT MOTHER as above.